Alan Richardson and Karen Tack, authors of New York Times bestselling cupcake cookbook Hello, Cupcake! and the upcoming What's New, Cupcake? sent us these instructions and photo on how to make adorable football cupcakes. As soon as I posted this saying I couldn't get the photo to upload, it uploaded. What do you know? I really don't care about the Super Bowl, personally, but I do love Malomars, so I'm all about this! Visit the Hello, Cupcake! blog for more fun cupcake decorating tips. We love the Saints, but wait, we also love the Colts. We are so torn between the two that we are pretty sure we will be binging on cupcakes to soothe our nerves during halftime on Super Bowl Sunday. So what better way to tame our "who do we love more" anxiety than with a big supply of Football Cupcakes for the halftime break. We made the footballs from Malomars and marshmallows. A perfect pairing because both are tasty marshmallow treats. Malomars are only available in the cooler months so they are a rare seasonal treat and we want to make the most of them while we can (eat your heart out Alice Waters). 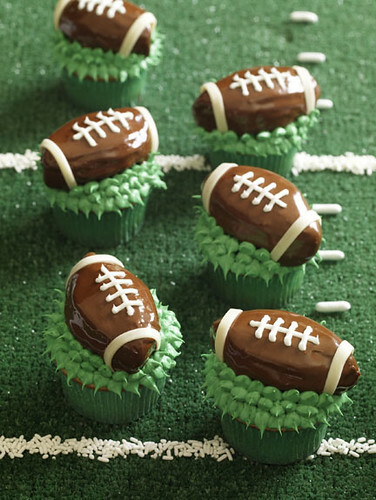 The football is made by placing a Malomar on each cupcake (attached with frosting). We cut a marshmallow in half on the diagonal and placed the triangle-shaped half marshmallow at each end of the Malomar and filled in the gaps to shape the football. We chilled the footballs in the freezer while we melted chocolate frosting in the microwave. In 20 to 30 seconds, with occasional stirring, the frosting was the texture of slightly whipped cream. We removed the footballs from the freezer, dipped each in the melted frosting, letting the excess drip off, then inverted and set aside. Once the frosting was firm we added details with vanilla frosting to make the laces and stripes. The last step was to pipe green-tinted frosting under each football for Astroturf. We served them on a square of real Astroturf with sprinkles and Jelly Belly Licorice Pastels for the markings.